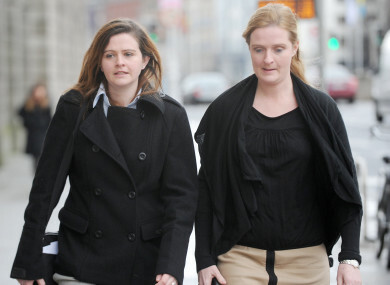 Brenda (left) and Ciara Quinn are part of the action taken by family members against IBRC. THE LONG-RUNNING dispute between the children of Sean Quinn and Irish Bank Resolution Corporation (IBRC) opened before the High Court today. The case relates to loans of €2.34 billion that were provided by Anglo Irish Bank to Quinn Companies. It is the case of the Quinn children that they received no legal advice in relation to these loans and, although they signed various documents related to them, they were only shown the “signature page” which they then signed. They would have signed these documents related to the loans because of their senior roles within the Quinn Group but it was argued in court today that their father Sean Quinn was directing the control of the business. Furthermore, it is alleged that Quinn had built up a significant stake in Anglo, the bank was fully aware of what was going on, and left the children facing “disastrous consequences” as a result when the bank began to fail. The legal action was first filed in 2011, but it faced delay as criminal cases progressed against a number of former Anglo officials. The Quinn children deny any liability for share pledges and guarantees in relation to these loans in this case against IBRC – the successor to Anglo. The case opened this morning before Mr Justice Garrett Simons in the Four Courts in Dublin. Firstly, it began with an opening statement from Bernard Dunleavy SC, on behalf of Aoife, Brenda, Ciara, Colette and Sean Quinn Jr.
Dunleavy said that, during the 2000s, it would have appeared on paper that the plaintiffs were to be “regarded as being among the richest people in the country”. The Quinn children might have been owners of Quinn Group ROI but at all material times, it was in control of their father. The transactions at the centre of this court case between Quinn Group and Anglo Irish Bank from 2005 onwards relate to loans forwarded to Quinn Group to meet certain commitments it had made in regards to shares. Such commitments came in the form of contracts – called CFDs – that were based on Anglo’s share price and effectively a gamble on what direction it would go. As the bank’s share price began to nosedive from late 2017-onwards, it meant that the Quinns’ investments were heavily exposed by this fall. Prior to the bank’s collapse, Quinn had built up a 24% stake in the bank. This “ultimately had disastrous consequences” for the plaintiffs, Dunleavy said. He said it would be the Quinns’ case in this trial that they signed documents relating to these contracts, but did so without financial or legal advice. Furthermore, he said that these documents were signed by the Quinn children without reading the full agreements, and the plaintiffs accused Anglo of breaching its duty of care to them. Dunleavy said that the children were not responsible for the financial transactions with Anglo in this regard that had such negative consequences for them. “[Sean Quinn] had total operational control of the business,” he said. “What he said, went. The possibility of refusing a request from their father was something beyond their comprehension. With Mr Quinn and the bank – no matter how fast they ran, they never seemed able to catch up with the falling share price. Dunleavy added that when the “jig was up”, Sean Quinn “gambled with his children’s property, not his own”. “It’s the consequences of that gamble that the children have to live with today,” he said. The senior counsel added that his team had combed through case law to find any such similar case before the courts, and could not find one. He further alleged that Anglo never sought to meet the children at various stages that directly affected them, and that it was the view of the plaintiffs that Anglo wasn’t just a “bad bank but the worst bank”. A separate case, taken by IRBC against members of the Quinn family, alleges a conspiracy to strip assets worth €455 million from companies in the Quinn international property group. It will take place after the conclusion of this case, which is expected to take up to six months. It is believed that witnesses in this case could include David Drumm, former head of Anglo Irish Bank who is currently serving a six-year term in Mountjoy prison. Email “Sean Quinn 'gambled children's property' which left them faced with 'disastrous consequences', High Court hears”. Feedback on “Sean Quinn 'gambled children's property' which left them faced with 'disastrous consequences', High Court hears”.